In collaboration with Tasty, Easy Lamb. It’s National Curry Week! The week of 9-15 October 2017 has been designated the week to celebrate all that is wonderful about curries. As an aside, it’s also National Chocolate Week (isn’t this the best week ever!). To help celebrate National Curry week the team over at Tasty, Easy Lamb asked me to come up with an Indian tapas-style recipe featuring lamb. I pondered for awhile, and then, while out on a long cycle one sunny day, was struck by the idea of making samosas. It’s been absolutely ages since I’ve made samosas, and I don’t know why as my family love them. 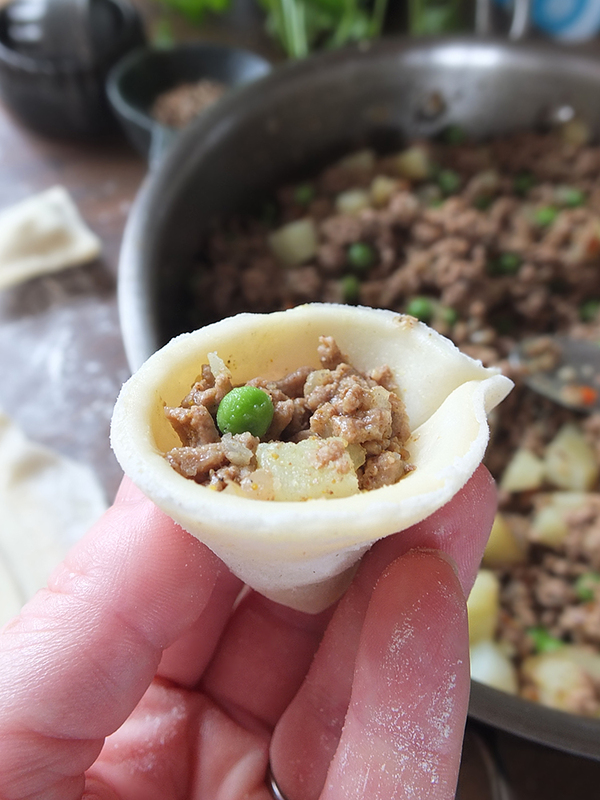 To bring things up a notch and make the samosas more tapas-like I thought I’d make them miniature in size, and this mini lamb, pea and potato samosas recipe was created! 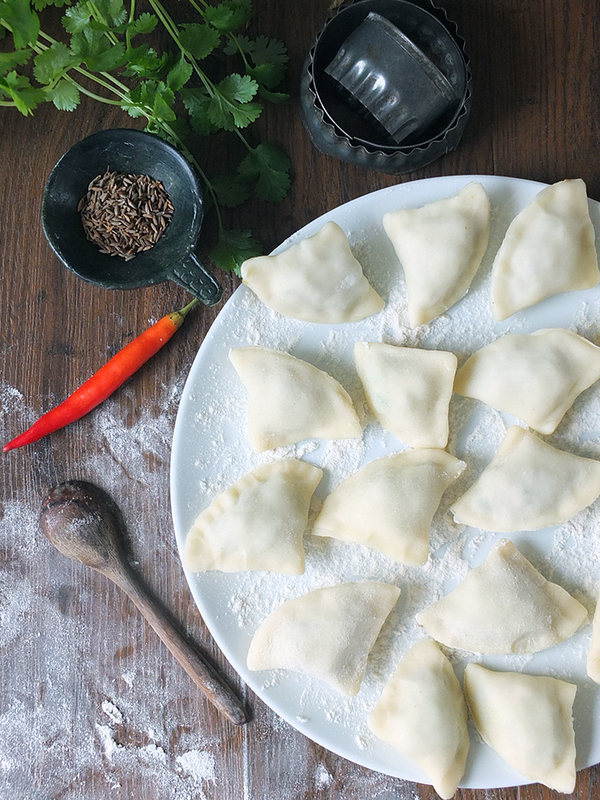 Samosas are actually remarkably easy to make, especially if you buy ready-made pastry. I’ve used shortcrust pastry for mine, but you could use filo pastry if you wished. Shortcrust pastry is really easy to use, and my kids love it, so I’ve opted for that version for this recipe. The trick is to roll the pastry out as thin as you can so that it doesn’t tear. Cut the pastry into rounds, and then cut each circle in half to make two semi-circles. Using a finger dipped in water, moisten the cut edges all around and pinch the straight sides together to make a small cone shape. Spoon in a little of the lightly spiced lamb filling and then carefully pinch the top edge closed. Samosas are traditionally fried or baked, and for my recipe, I’ve deep fried them in sunflower oil. You can, if you want, brush them with some oil or melted butter and bake them at 180ºC/350ºF/gas 4 for around 25-30 minutes, until golden brown. If you’re deep frying, I would highly recommend using a digital thermometer to keep an eye on the temperature of the oil. If the oil is not hot enough you’ll get soggy samosas, and you risk a fire if it’s too hot. You want it between 165 – 175 C.
Samosas can be eaten hot, right away, or served at room temperature. Any leftovers work really well in packed lunches the next day. 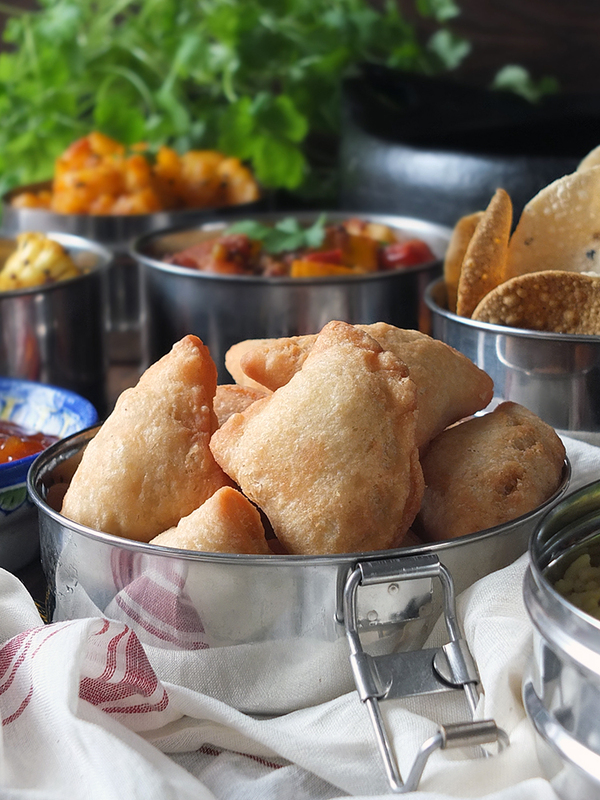 Serve your samosas with some mango chutney and a selection of other Indian dishes – I made Bombay potatoes, a cauliflower and fennel curry, a kheera cucumber and tomato curry, rice and a lamb madras to go with mine. I’ve also kept my samosas more on the mild side, so the whole family could enjoy them. While I enjoy more of a kick in my recipes, my husband and children prefer milder flavours. If you want to up the heat a bit, add a bit more chilli to the mixture. 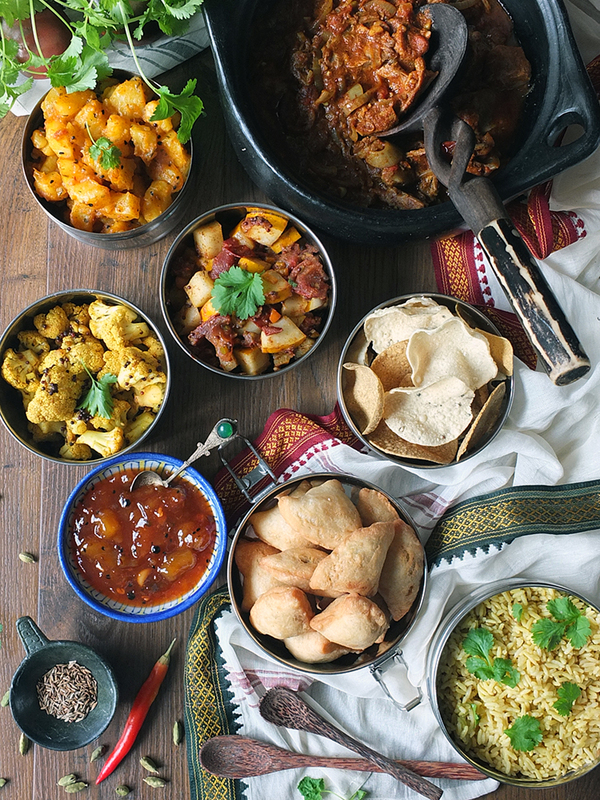 How will you be celebrating National Curry Week? What’s your favourite curry? Let me know in the comments! For more lamb recipe inspiration visit the Tasty Easy Lamb website, and follow them on Facebook, Twitter or Instagram. 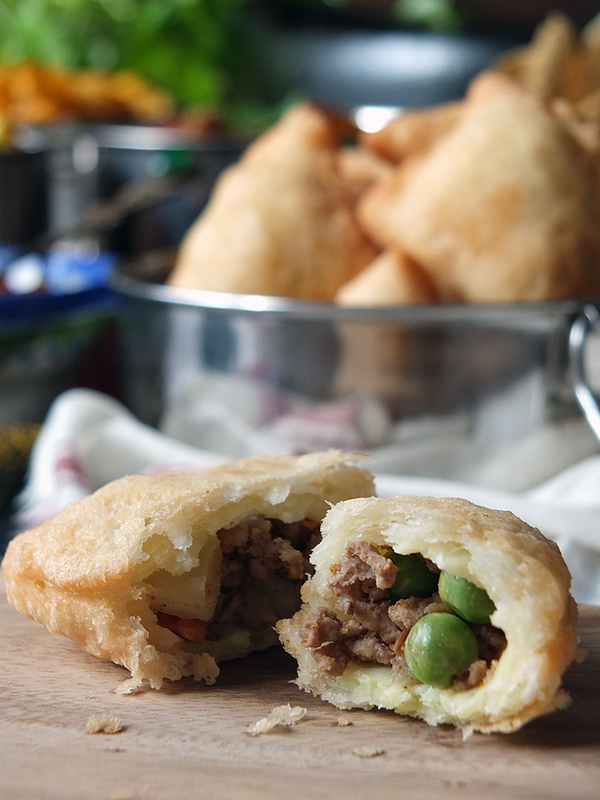 Mini samosas with lightly spiced lamb mince, fresh peas and chunks of potato. Perfect for an Indian tapas, or even lunch boxes! Heat sunflower oil in a frying pan and fry the cumin seeds until they begin to pop and smell lovely and toasted. Add the onion and chilli and cook for a few minutes, until the onion begins to soften. Add the lamb mince and cook until browned. Stir in the garam masala and the peas. Cook for a further minute and remove from the heat to cool completely. Cut your cool, boiled, peeled potatoes into 0.5 cm dice and fold into the lamb mixture. Bring your shortcrust pastry to room temperature and roll out as thin as you can. Cut the pastry into 10 cm circles, and divide each circle in half with a sharp knife. Moisten all the edges of the half circle with a finger dipped in a bowl of water. Pinch the straight edge together to make a cone shape. Add a teaspoonful of the cooled lamb, pea and potato mixture, and carefully pinch the top edges closed. Make sure you pinch well, because if you don't they will open when you fry them. Pour enough sunflower oil into a heavy based pan to measure a depth of 4 cm. Bring the temperature up to 175 C and carefully drop the mini samosas, 6-8 at a time, into the oil. Deep fry until the samosas are golden browned all over. Remove with a slotted spoon and transfer to some paper towel to drain. Bring the oil temperature back up to 175 C and repeat with the remaining samosas. 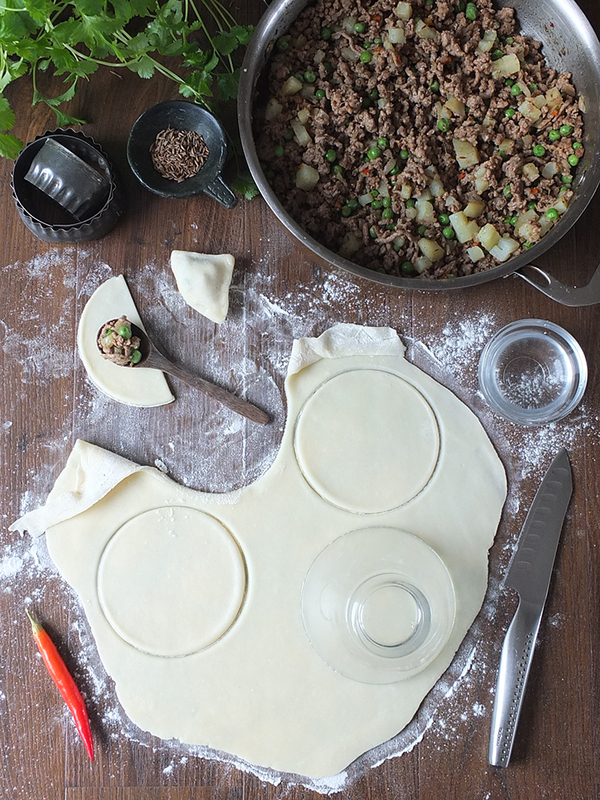 You can buy lamb mince in the supermarket usually in 500-gram packets, so why not double the filling recipe and freeze the extra for another time? That way all you need to do is roll out the dough, assemble and fry! You can also bake the samosas in the oven - brush them with some oil or melted butter and bake them at 180ºC/350ºF/gas 4 for around 25-30 minutes, until golden brown. This is a commissioned recipe for Tasty, Easy Lamb. Thank you for supporting the brands who make it possible for me to do what I love: mess up my kitchen and share recipe stories! Wow.. i am feeling hungry after watching all those samosas . It is really crunchy and mouth watering especially when it is server with red and green sausages. This looks delicious! I would love to try it. I’m not a fan of lamb but these look delicious! Could I substitute with ground beef? I absolutely adore samosas, but I’ve never tried making them myself. Your photos are so mouthwatering, I think this may be my weekend project! That looks like one awesome feast! I can almost smell it from here – so flavorful and fragrant. Yum! I’ve never had samosas but do love Indian food. These look like a great appetizer to get the party started. Looks delicious. These are adorable. I love party foods and I could eat a TON of these! I actually have some ground lamb that is waiting to be used. These look perfect for any gathering and surely will be gone in no time! Love how you explained the making process in details and using photos which are beautiful! What a gorgeous recipe! What fantastic images! 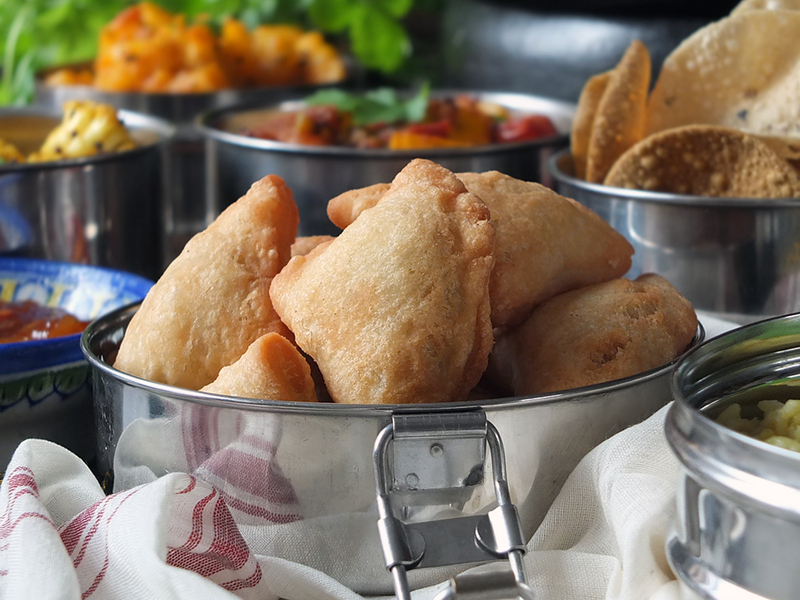 I am so inspired to create these mini samosas for my family this weekend. I can almost taste the scrumptious flavors right now. I love lamb this looks amazing. Looks super delicious I would love to try this! First, I’ll say curry has become a weakness for me. I love curry chicken and goat. With that being said, the samosas look amazing and the fact that they are mild is a good selling point! I will definitely try making these over the weekend. I’ve been looking for Lamb Recipes. Finally got your list. Thanks! These look delicious. 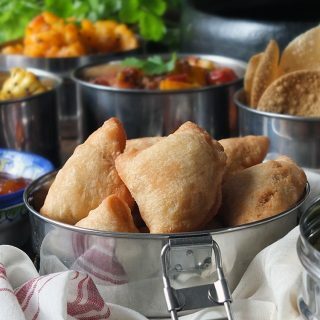 We love samosas in our house so will definitely have to give them a try! Rebecca Smith recently posted…What’s On Your Halloween To-Do List? These look and sound so delicious! Lamb is my favourite meat so I would love them. I’ve never tried cooking samosas before, it sounds quite easy so I’ll definitely give it a go. I love samosas but have never thought about making them – off to pin this for later! I love samosas! It’s the first time I saw a lamb recipe of samosa. I hope it’s good. Thanks for sharing. i have never made samosas but i have had them many times. they are so good and everyone should try them at least once. i may have to try making this. What I really like is how food really brings things together. There are so many different cuisine and almost all of them have some kind of meat pie. Aw yay now that is my favourite kind of week, I love that it is national curry week. Especially since Indian cuisine is my favourite and your samosas look like they are to die for! Yum! I haven’t had lamb in ages. These look so delicious. I would be excited to try them out! I’m probably too lazy to make them on my own so I need to find someone to whip these up for me. These looo amazing, beautiful photography too. I’m not a fan of mint so I’d probably leave that out for myself. Samosa are awesome! I’ve never heard of Indian tapas! this has given me food inspiration! I can’t wait to pull this trick, the next time I host a dinner party. I would to make the baked ones! I love lamb and these will be great! I love samosas but have never made my own! These look so delicious and not that hard to make, I reckon I could just about manage it! I LOVE samosas and haven’t tried to make them before. This sounds scrumptious and I’ll be adding this recipe to my collection! Oh now I need to try this, it looks absolutely delicious and I do love a good samosas and need to try making my own! What a great week!! I love Samosas!! And I think I’ll love pea Samosas even more!! Loved all the things you’ve shared here! Ohhh they look absolutely lovely. I wouldn’t be what you’d call adventurous in my cooking ,but I think I’ll try this with my friend ,cos she’s a great cook !! These literally have my mouth watering just before lunch time – especially as some has just come back to their desk with a microwave Chicken Tikka, I’m now in the mood for Indian! Never thought about an indian tapas, but I love so much of the sides and starters from Indians it would be a great option!